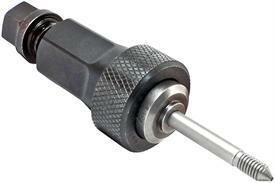 Omega blind nut, blind bolt modular installation hand tool. Blind nut, blind bolt modular installation hand tools from Omega Technologies lowers the tool cost when comparing the need to use multiple single purpose tools for the same job. With the OMEGA blind nut, blind bolt modular installation hand tool, there is no longer a need to purchase unique tool assemblies for every fastener style or size. The OMEGA blind nut, blind bolt modular installation hand tool allows for the interchange of anvils and mandrels permitting one base tool to install all fasteners within the capability of the tool. The OMEGA BH1100-1032/M2 Blind Nut Blind Bolt Modular Installation Hand Tool is one of thousands of quality tooling products available from MRO Tools. Please browse Blind Nut / Blind Bolt Hand Installation Tools for tools similar to the OMEGA BH1100-1032/M2 Blind Nut Blind Bolt Modular Installation Hand Tool. OMEGA BH1100-1032/M2 Blind Nut Blind Bolt Modular Installation Hand Tool description summary: Omega Technologies blind nut, blind bolt modular installation hand tool. Assembly Unit: BH1100 Mandrel Included: M2-1032 For Fasteners: BN359, 1032 Quantity discounts may be available for the OMEGA BH1100-1032/M2 Blind Nut Blind Bolt Modular Installation Hand Tool. Please contact MRO Tools for details.